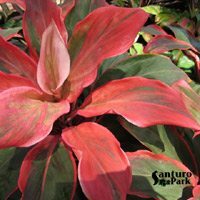 Cordylines are an increasingly popular foliage plant, in particular the varieties with red leaves such as ‘cordyline rubra’. 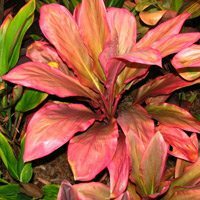 The tropical varieties pictured in this article have broad and colorful foliage and are much sought after. This article and photographs, supplied courtesy of Santuro Park, highlights the wide variety available from specialist growers. 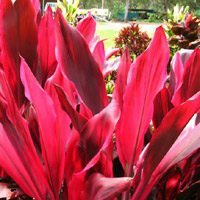 Cordylines are fantastic foliage plants and can be grown in many areas of Australia, frosts and extreme cold are the main inhibitors. When grown outside, cordylines seldom suffer from stress. If they do it is caused by one of three things. 2. Too much hot sun. Oranges, Purples & Whites are more likely to be affected, while many Reds can withstand full sun. 3. Insects :- mealy bug, garden loopens, mites & grasshoppers. 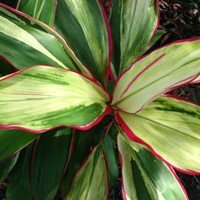 Cordylines are not a fussy plant. Any fertilizer formulated for non-flowering plants will work. Organic fertilizers offer a gentler approach, while Inorganic provide high amounts of nitrogen, potassium and potash. You should fertilize every 6 months. They are a plant that grows in most soils, preferring a well drained soil. They grow well in coastal areas as well as inland. A large variety can be planted in full sun, while others prefer part shade. Once established they will tolerate less frequent watering. Due to the many different varieties and leaf shapes they make an attractive plant for any garden environment, from miniatures to tall landscaping plants they will suit all types of gardens. Although they flourish best in tropical and subtropical conditions, there are varieties that have adapted to the cooler conditions of the southern states, and an example of this is C. Rubra which shows it’s brilliant colours in the cooler months. If grown in an area that suffers from frosts ensure they are well protected, or if grown in large pots bring them under cover in extreme cold. Our experience has shown that common opinion indicates that cordylines only prefer shaded areas, however we are pleasantly surprised to learn that they can tolerate a lot of morning sun, and in fact some show better colours in this situation.